Gym teacher cake graduation cakes Long Island New York. This gym teacher graduation cake is a half sheet multi-layer cake designed for a recent college graduate. The client specifically requested a gym teacher cake that resembled a typical high school gym floor. We created just that with a few sports court cake additions. In order to create this effect we used marbleized fondant to create the wood floor. Carefully hand painted lines were added to the gym teacher graduation cake to resemble a high school gym basketball court floor. In addition we added many sports court items including the jump rope, football, basketball, baseball, etc. Surrounding the sides of the gym teacher graduation cake are lockers, which of course represent the lockers you would find in a high school locker room. 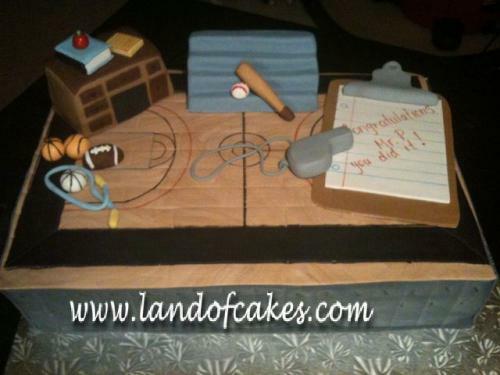 This is our own special touch to this basketball court cake. The clipboard and whistle were requested by the client and we enjoyed creating such lifelike edible cake decorations. This gym teacher graduation cake is made with a special recipe chocolate cake filled with a special made peanut butter filling. The fondant decorations covering the cake helped to keep the cake moist and delicious. As always, this cake was delivered free of charge to our Greenlawn, New York client. Greenlawn is located on Long Island near Huntington, New York. This is a wonderful teachers appreciation gift, and one of our most fun cake creations yet. Order your next cake from Land of Cakes New York.